Summary: Hidden deep within the figures tracking the ups and downs of the stock market lies a terrifying truth: America is under attack. Our government . . . our economy . . . our very way of life are in the crosshairs of a ruthless enemy . . . and no one knows. Except Garrett Reilly. He has a knack for numbers. He sees patterns no one else can. His gift has made him a rising star on Wall Street. But when he notices that two hundred billion dollars’ worth of U.S. Treasury bonds are being sold off at a terrifying rate, his gift makes him the most wanted man alive. The U.S. military wants him for his extraordinary abilities. They need someone to lead a crack squad of rogue soldiers to act as the last line of defense in a war that could mean the end of everything America holds dear. And everyone else? They just want him dead. 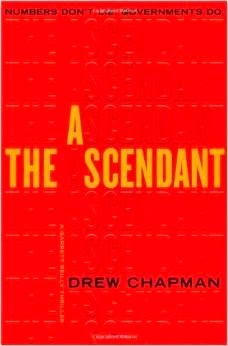 THE ASCENDANT by Drew Chapman is a thriller that takes the reader into an unconventional war that is fought with digital technology instead of weapons and troops. The main character is Garrett Reilly, a Yale dropout, who makes millions trading bonds on Wall Street. Reilly has the unique ability to sort through massive volumes of data and find any logical pattern that may exist in the data. When Rielly’s special gift leads him to discover that billions of dollars of U.S. treasury bonds are being sold off by China at very low rates, the U.S. government becomes very interested in his abilities. This bond activity and other Chinese actions has convinced the U.S. government that China is waging a digital war against the United States. As a response, the U.S. military has established a secret program called Ascendant and they have been searching for a leader who “thinks outside the military box”. Garrett Reilly appears to be the man they have been searching for to lead the effort. The U.S. Army sends beautiful (of course) Army captain, Alexis Truffant, to recruit him. In spite of a deep hatred for the military since his brother died in combat and no true loyalty to his country, Reilly reluctantly agrees to take charge of the program. Reilly and his group of misfit Techies are charged with executing a retaliatory stealth war against China. While executing his digital war against China, Reilly’s efforts are constantly slowed by outside influences. He’s been impeded by the Secretary of Defense; he’s been targeted by a mysterious international character; he’s been severely beaten by a group of Marines in a barroom fight and he’s been tortured by Homeland Security agents. Nevertheless he finds the key to why the Chinese are waging this internet war and establishes his counter attack. Author Drew Chapman does a creditable job of character development. Reilly and his computer geeks are quite engaging and are easy to cheer for as they try to execute this new kind of war. Chapman delivers a story that is face-paced and suspenseful but could probably be done as effectively in less than 388 pages. The conclusion is left somewhat up in the air which leads me to believe a sequel will soon be on its way. The one thought that remained with me is that the drama played out in THE ASCENDANT is very believable and scary. If you’re a fan of thrillers I believe you would enjoy THE ASCENDANT. That sounds scary because it sounds like something that could really happen.